Lunches on Fridays tend to be a little different to the rest of the week… for starters, normally the kids don’t need to take a packed lunch into school as they all have a half-day on Fridays. So normally I am just making a lunch for Hubby and me, plus something for the kids to snack on once they get home. Today was different in that I was only doing one hour of massage at work (10am – 11am), so I was home by mid-day… this was because I cut my wrist really badly on a broken glass in the dishwasher, had stitches and was unable to work because of that (did I mention that ? I forget! )… today was my first day back at work. So really I was only doing a packed lunch for Hubby. He also took a 1/4 cup of walnuts separately for snacking and a bottle of water. 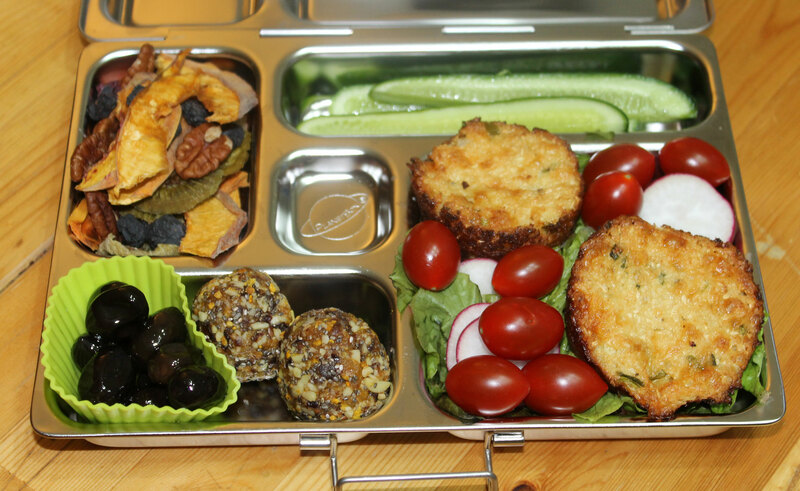 This entry was posted in School lunches, Uncategorized and tagged gluten-free, grain-free, healthy, low carb, packed lunch, paleo, primal. Bookmark the permalink. I love, love, love that you share these. It’s so incredibly inspirational. Thank you!